The sE2000 is a second-generation, entry-level condenser microphone. Like the original SE2000, it has a large-diaphragm capsule, a fixed Cardioid pickup pattern, and a transformer-coupled output circuit. Onboard switches below the headbasket enable a -10dB pad and a high-pass filter (cutoff and slope have not been identified). 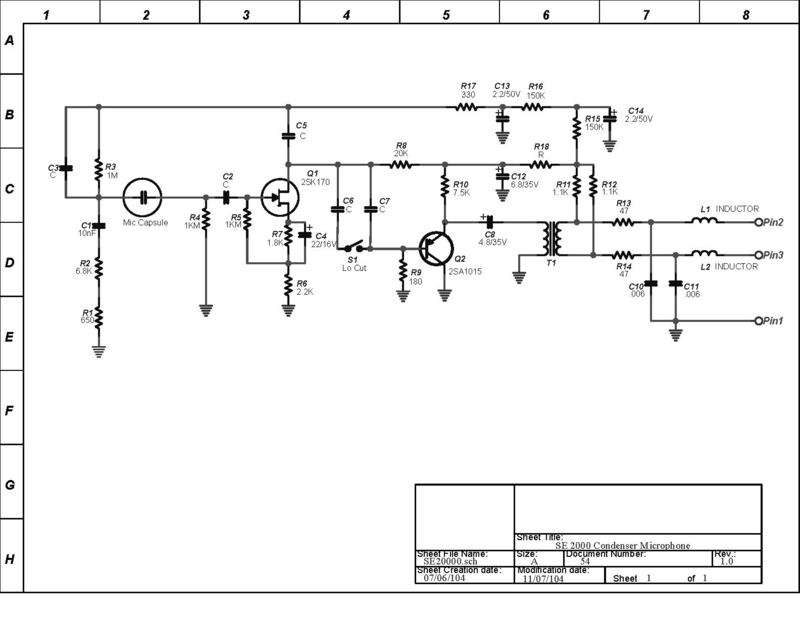 Based on the schematic linked from the sidebar, the SE2000 circuit appears to be very similar to the ADK A51/MXL 2001, with the addition of a high-pass filter and pad. This means the mic has “negative feedback” in the circuit, intended to provide corrective EQ to a K67 capsule. In other respects, the SE2000 circuit is much like the AKG C414EB circuit, with a two-stage transistor amplifier and low-ratio transformer. The mic shares the name with its predecessor, a rebadged Feilo CR1-87, but differs in body size and shape, grille construction, and most likely the capsule and circuitry as well. See also the sE2200a, which has nearly identical features and specifications. According to sE Electronics, the 2200a uses the same center-terminated capsule and tuning, but higher-grade electronics, switches, shockmount, and a larger body/chassis. The sE2000 is no longer in production, but (as of late 2011) can be purchased at some European and UK vendors while stock remains available.